This post is brought to you by Instagram, because I didn't have my good camera on hand. Apologies in advance for any hipster-induced traumas that may result. In the absence of being able to bake myself, the next best thing is taking advantage of the many professional bakeries sprinkled throughout London. I have made it my mission to try as many of these bakeries I can in the upcoming months, the better to know which ones to take visitors to when they come! 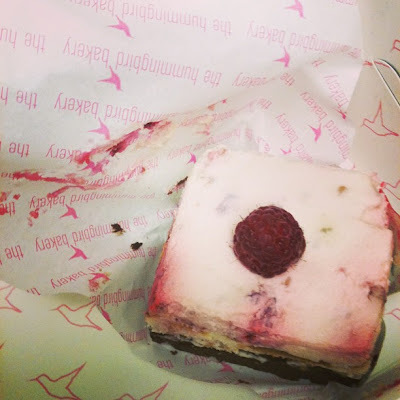 Yesterday I made a visit to The Hummingbird Bakery, one of the most well-established bakery chains in London. 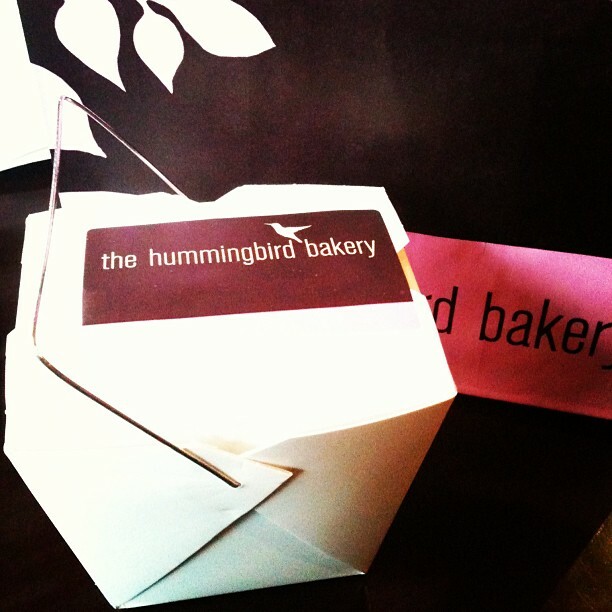 This was actually my second attempt to try Hummingbird; a couple weeks ago I tried to visit their Notting Hill location but found it closed for renovations! Yesterday's visit was to their location in Spitalfields, only two tube stops away from my campus. It wasn't as quaint a location - tucked away in an alleyway in a rather business-y neighborhood near the Gherkin - but it was more convenient than going all the way out to Notting Hill (a good 30-minute tube ride away). The shop itself has a very clean, colorful aesthetic. It's not cozy or overly decorative, but the simple pink and brown (see above packaging) decor is quite attractive and sleek. To be honest, I would have liked to see more selection. Aside from the classic (chocolate and vanilla, red velvet) there were only three "unique" options: carrot cake, black bottom, and black forest. 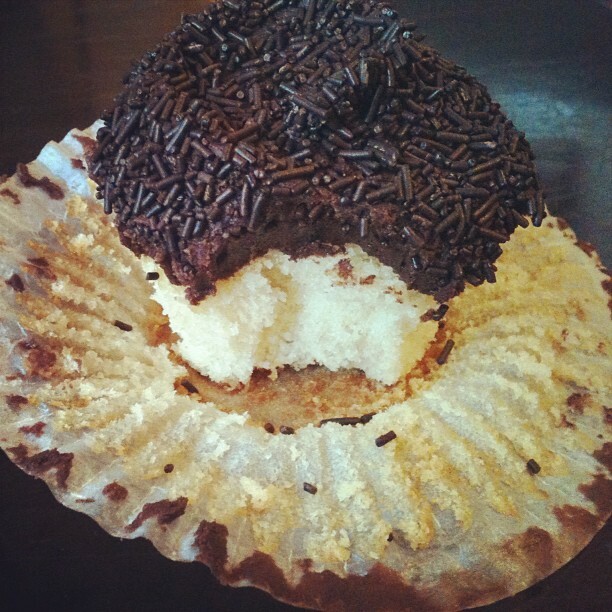 Not being overly interested in the three special options (I would have nabbed the carrot cake, but I have a carrot cake experiment coming up so felt I was good on that quota) I decided to sample a vanilla cupcake with chocolate frosting. 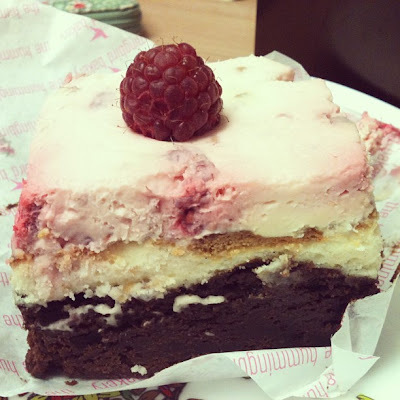 That, my friends, is a Raspberry Cheesecake Brownie. The above picture gives you a good view of its three decadent layers: a fudgy brownie base, topped with creamy baked cheesecake, and finished off with a raspberry whipped cream (no artificial raspberry flavoring here - you can see the chunks of raspberry in the surface of the cream). I meant to eat only half of the brownie last night, as I had already consumed a generously frosted cupcake earlier in the afternoon and didn't need a giant brownie to set off a massive sugar rush right before bed, but alas. The best laid plans...oh how often they go awry. I finished the whole thing. 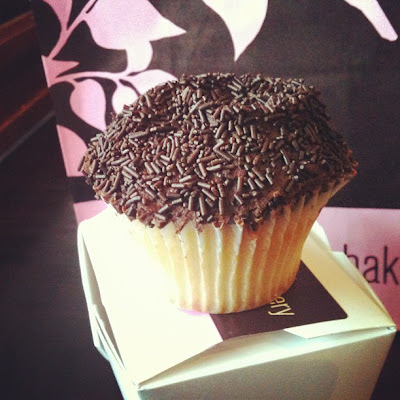 I will definitely be returning to The Hummingbird Bakery in the future! I saw on their "Daily Specials" menu that Fridays are Peanut Butter and Chocolate...so you know exactly when I'll be going next time.